Whenever I need to get far away from the hustle and bustle of Paris, I trek it to Le Domaine de Marie-Antoinette. Nestled behind Château du Versailles is a palace called “Le Petit Trianon,” along with a dreamy little hamlet created for the Queen. It’s the perfect spot for some tranquility, introspection, and splendor in the grass. Bewitching with its seductive cave, mystic temples, a tiny village (surrounded by farm animals and vegetable plots) and placid lake (complete with island and lighthouse), it’s no surprise that the countryside in miniature was Marie Antoinette’s favorite retreat from the very public and frenetic life she led back up at the main Château. Tip: Trekking to Versailles from Paris? 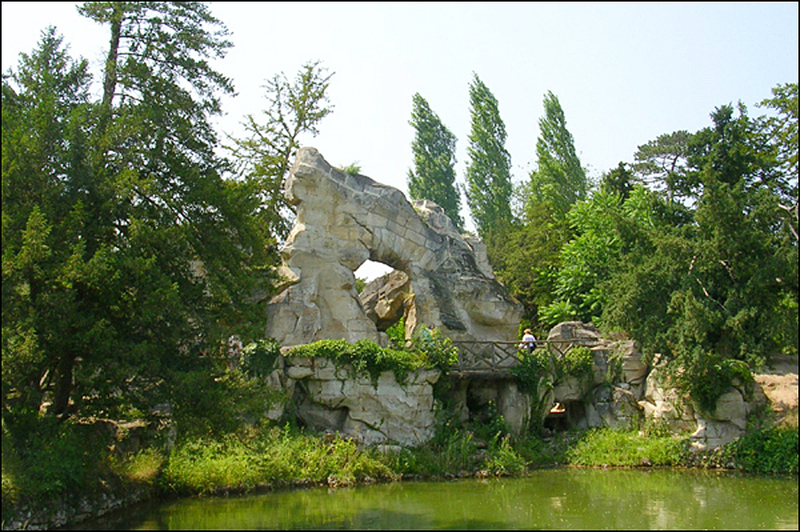 I recommend taking the RER C line to “Versailles-Rive Gauche.” The scenic train ride takes 30 to 45 minutes. Also, buy a round trip ticket while you’re still in Paris, because by the end of the afternoon ticket lines at the Versailles-Rive Gauche station can be horrifically long, while the self-serve ticket machines are often broken. 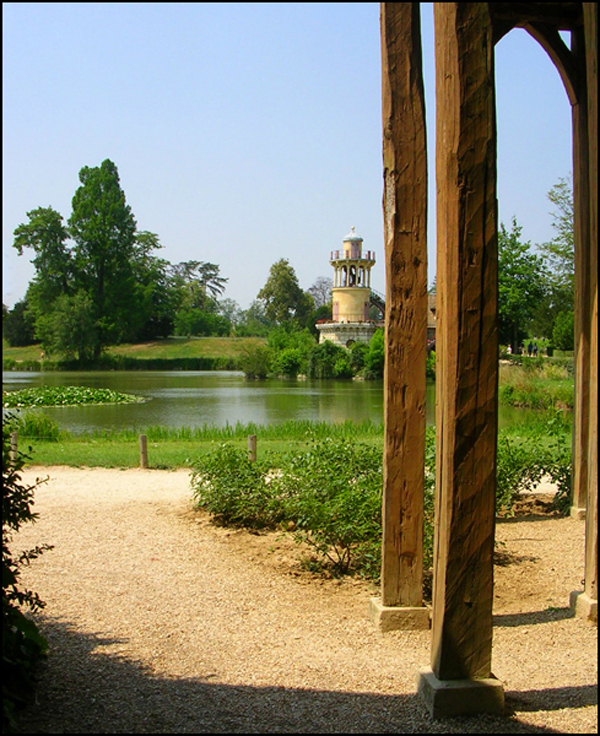 Once you reach the Château du Versailles, start looking for “Petit Trianon” signs. After paying the entrance fee at the gate, you’ll either hoof it down through the gardens and fountains, or take a tram directly there. Personally, I’d walk the walk. Along the way, there’s much to see. During the warmer months, amazing displays of aquatic artistry bring the palace fountains to life while piped in Lully and other Baroque favorites spray on to everyone’s delight. The weather and your entourage will most likely determine your mode of transportation. Take heed, because along the way you’ll encounter steps and uneven ground, especially treacherous after a downpour. So pack your Chucks or Keds, kids! There’s no set order to touring the grounds. At the Petit Trianon entrance, you’ll find a café with benches and the best chicken salad sandwiches I’ve ever stuck a tooth in. Here you’ll also find a welcome center, a WC, and a gift shop. Pick up a free map and plan your route at lunch. I usually start my stroll at the nearby Temple of Love, first paying homage to Cupid with crossed fingers and toes. Then, after putting in a cameo appearance at Marie Antoinette’s little theater, I follow the winding brook down to the hamlet. Stay on the path! Legend has it that back in 1903 two English school teachers, Charlotte Anne Moberly and Eleanor Jourdain brazenly took a short cut and ended up time trekking back to the 18th century. “Everything suddenly looked unnatural, therefore unpleasant; even the trees seemed to become flat and lifeless, like wood worked in tapestry.” Jourdain reported. So for the love of your pocket-sized technology, stay with your group! 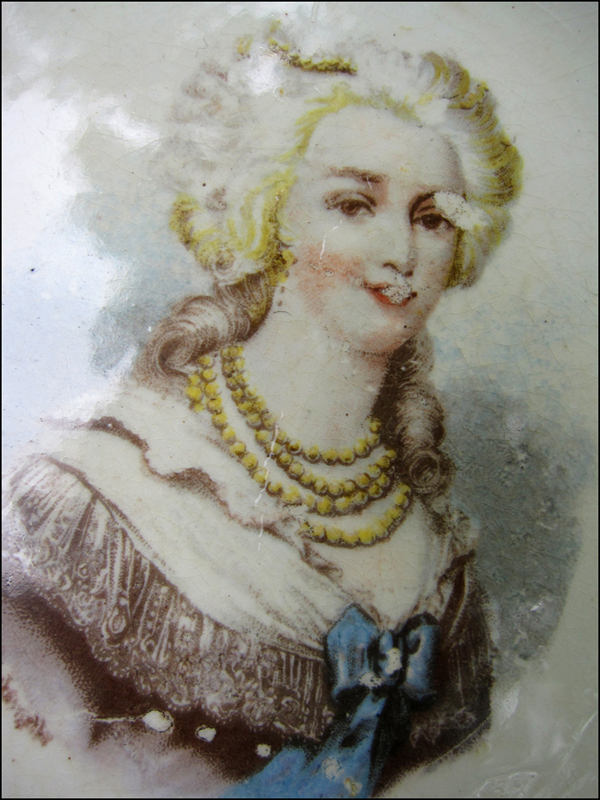 Marie Antoinette was just 19 years old when Louis XVI gifted the Petit Trianon to her. It was initially built for his grandfather’s mistress, Madame de Pompadour. Designed by architect Ange-Jacques Gabriel, this symmetrical royal haven with a neoclassical twist gave Marie Antoinette what she craved most—personal privacy and room to blossom. “Here I am me,” M.A. wrote. The Queen was also given full rein of the grounds. Inspired by Rosseau’s writings, she got architect Richard Mique and artist Robert Hubert on the case, and the dream team designed a rustic hamlet that was “charming, but uncultivated and wild.” Fully embracing shabby chic, painters were also called in to create faux wood with imitation cracks, splits, and green moss. Talk about getting all crafty! Here’s the squeal! Back in the day, visits were by invitation only, and costumes were kept unusually simple and informal for the time. “I shall be quite alone so don’t dress up; country clothes and men in frock coats,” M.A. scribed on the invitations. A “little” white gown, a gauzy hankie, and a straw hat was the expected attire at the Petit Trianon. Banned were big hats, long dress trains, and the wide panniers that put the hustle in the bustle. Here games like cards and blind man’s bluff were played both day and night. Let’s not forget the seesaw and the fleet of tiny row boats. At l’heure bleu, lanterns adorned the bushes, statues, and hideaways. Soon nocturnal fêtes, impromptu concerts, intimate co-ed suppers with BFFs, and private theater spectacles featuring the Queen became the norm at her private domain. On the boards in her very own theater, Marie Antoinette fearlessly took on her alter egos like an 18th-century Lady Gaga or Beyoncé, performing as milkmaids, shepherdesses, or village maidens. Studying theater, opera, and ballet (with celebrity tutors snagged from Paris), she managed to fine-tune her craft while crafting her own idyllic world. Despite her unfortunate fate, in this tiny theater, with its seats for only forty, its walls and ceilings of blue velvet and paper-mâché ornaments mimicking putti, shiny gold, and cool marble, her spirited dreams live on. More than anywhere else, you can still feel her presence here, so trust me, don’t miss it. 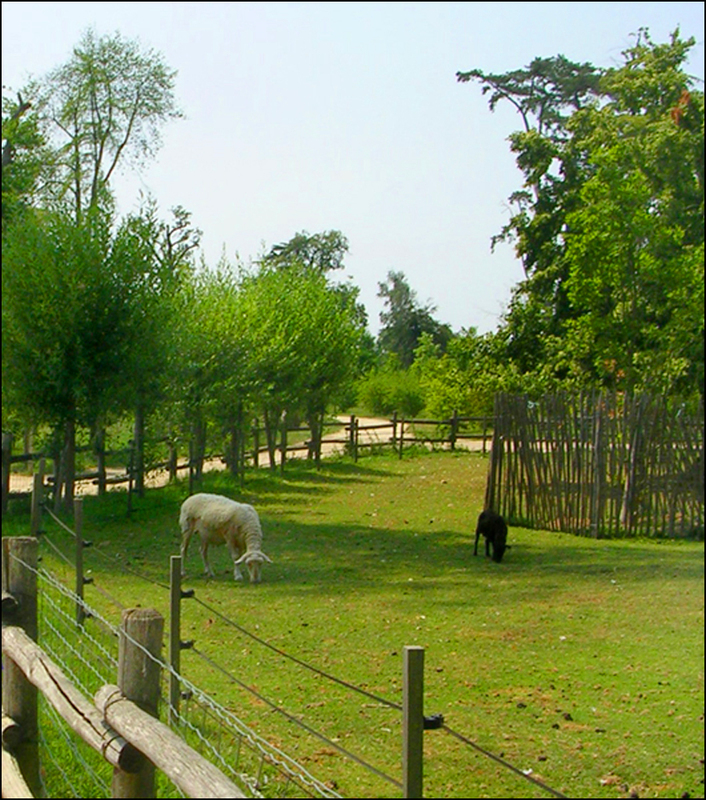 Need a lil’ hameau fix now? Sofia Coppola’s movie “Marie Antoinette” was shot on location. Man, the clubhouses of the rich and famous…! Thanks for the lovely vacation from my routine, Theadora! Theodora I am so smitten with this post I’ve read it four times (and I’ve been to Versailles myself!) Would you ever be interested in a collaboration? Your photos are inspired, I’d be curious to see what was left out! Thanks for the stroll, Rhonda!! Back in the day, all you needed was a sword to gain entrance to Versailles. Funny tidbit! Animals were everywhere, including birds, snakes, cats, dogs, and spunky monkeys! I bet the palaces were pretty darn smelly but still gorgeous! T. Ha!! Funny. Great idea!! Or perhaps a seamstress?! Crafting with the Queen and entourage would have been fun! I love to work with Toiles De Jouy. T.
Sure…but I can’t sew a stitch! T – you make me wish I was in Paris. Cold and grey here in Syders. I fancy a wee trip…. Merci!! Say, I’m still dreaming about your “apple” and “cactus” stools! I’m sure they would have received Marie Antoinette’s Good Palace Seal of Approval!! T.
Loving Theadora’s posts at the moment. She’s writing about places we’re planning to visit this year and the extra information is so great as it’s information that I wouldn’t find in guidebooks, etc. I’m loving all your posts at the moment. You’re posting information on places I have already planned to visit during our trip this year. Versailles and Le Hameau de la Reine is another one on the list and you’ve provided lots of added information that’s really supplementing my research info. Loving this… and thanks again, Theadora! I’ve reblogged this post. Merci, Vivien!! I’m looking forward to reading your Paris dispatches. They’ll be fabulous. I know it! 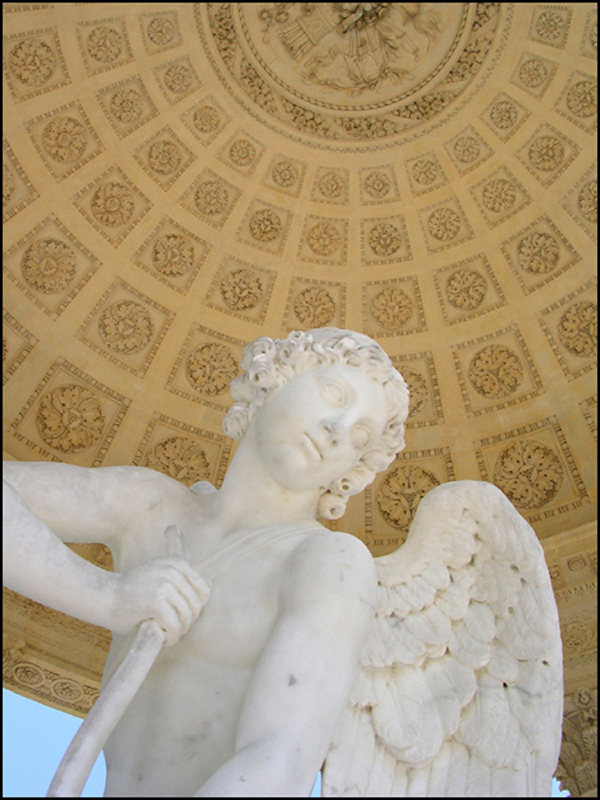 By the way, while you’re in Versailles, if time permits, visit the Osmothèque Versailles. It’s both a perfume museum and conservatory! A few years ago, they helped re-create M.A.’s perfume. Formulated French nose Francis Kurkdjian, “Marie Antoinette Sillage de la Reinecost,” it’s made up of rose, jasmine, and tuberose, along with orange blossom, cedar wood, and sandalwood. Price tag? 300 to 400 euros!! The Osmothèque Versailles often offers workshops and classes. 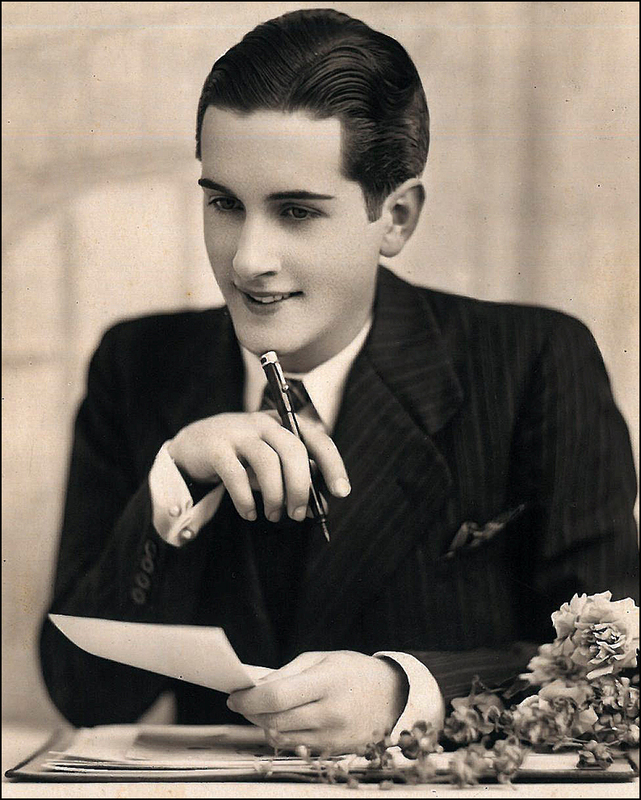 A few years ago, I got to smell original classic French scents by Guerlain, Coty, and Molinard, along with Houbigant, Bourjois, and Lanvin-just to name a few! It was heaven!! Luckily, the class lasted three hours! It’s also affordable. At the time, it cost just 7 euros. Worth every SCENT. Merci beaucoup, babs, for a wonderful tour of a place new to me. Sumptious images and grounds! So very lovely! Thanks, Virginia!! While strolling, I spotted a few white fetching bunny rabbits. Big wigs Oswald and Edward would absolutely dig the grounds at Versailles! Perhaps Oswald has made the jaunt?! T.
I missed Versailles on my last trip to Paris…so next time for sure! I really need to visit Paris. This is beautiful. Bravo! My son is here visiting and he loves Paris. Will have to check this out next time I’m in the area!! Cheers! Nice! We enjoyed Sofia Coppola’s film very much! Such a long time since we were last there – looks in even better shape. Glorious place to get lost in for a day. Sounds to us that you could happily be MA yourself, minus a few distractions. The Sophia Coppola film captured it beautifully. Yes, we had the most fabulous, wind free time there and the fountain shows were wonderful. 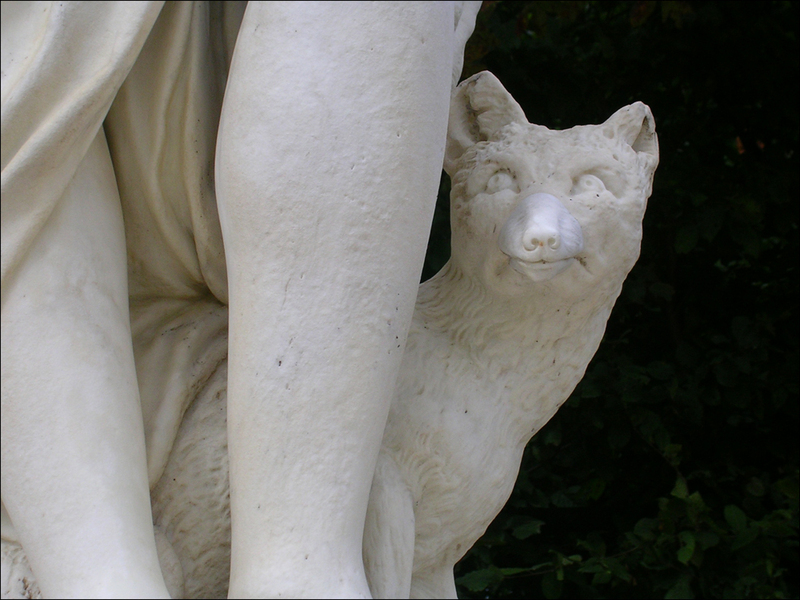 Do look forward to the Fitzgerald cat! 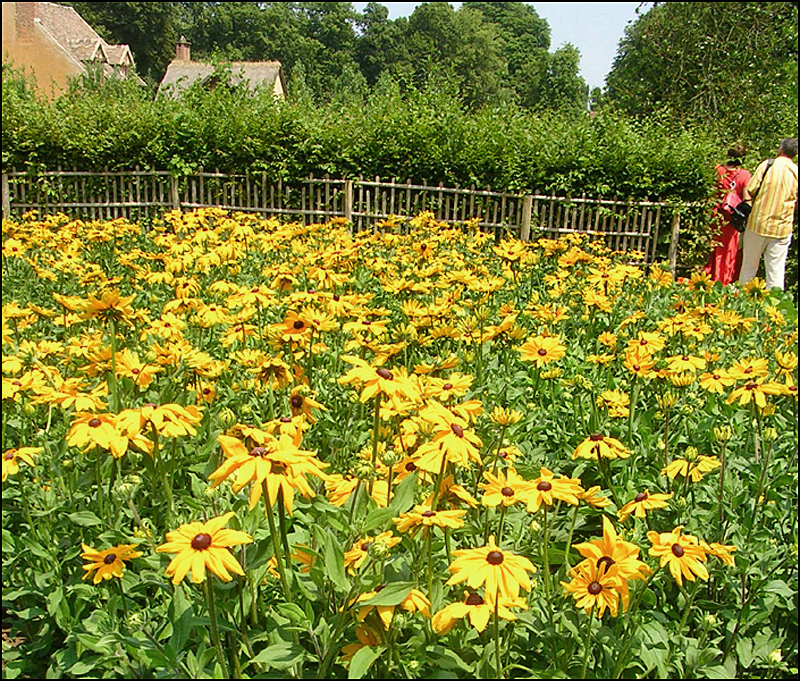 Le Hameau was my favourite part of Versailles, even though I was there in the autumn and it wasn’t nearly this pretty. Thanks for the gorgeous summer pics! Thanks, Krista!! I love strolling the grounds at Versailles and Petit Trianon during the fall. I used to compete in the Paris to Versailles race. It was mostly uphill! One mile boasted a 10 percent grade! It was fun. Plus, they gave out medals and roses! After running, I’d spend the day walking and resting by the fountains-yes, wearing my medal! France is a great place to race. The competitions are usually inexpensive and the prizes are always beautiful. Sometimes they give out compact mirrors, oysters and dark chocolate! T.
Wonderful post and images (love it) you’re getting better…Theodora!! Congrats …. clap clap !! Ah, Marcos!! Thank you for your sweet, sweet words and clap-clap-clapping!! The feeling is quite mutual. Your work always pretty darn fab. I loved your sand and sea series. Golly, I could almost hear the waves crashing!! T.
Thank you so much Theodaora!! I’m glad that you like my work, you are very inteligent and has an incredible ability to write, I admire your work. You are a person that everyone wants to be around…to talk, etc… And to have a true friendship! You are a sweetness. I’ll check it out and spread the word, of course!! Marcos, thanks for the link! 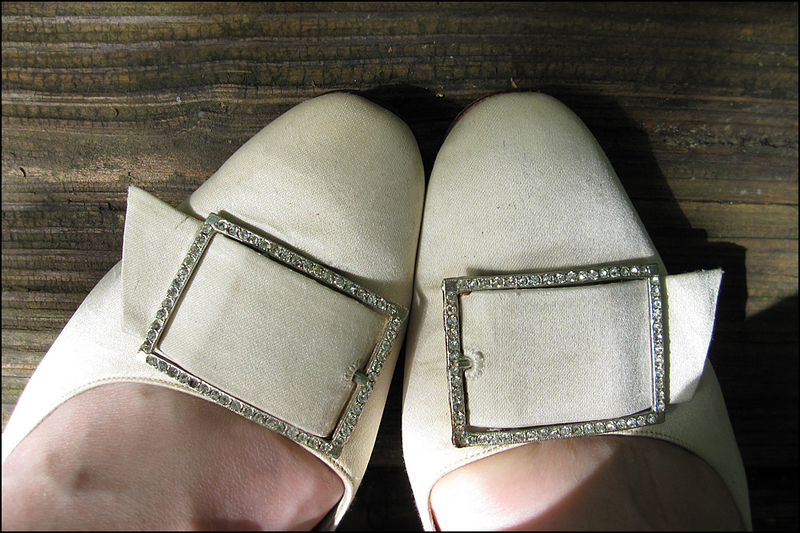 T.
Hey , My Mom used to have such shoes in the 60’s! Fab shots! Thanks, Ann!! How cool is that! What color? Fabric? Roger Vivier created the shoes in the top shot. His innovative designs have inspired both Christian Louboutin and Manolo Blahnik. Gorgeous!! T.
I am leaving Paris soon after being here for 3 months and I already know I am gonna miss every bits about Paris.. I know!! It’s not easy! We are moving to London soon so it’s not SO far away from here … but still I feel like next time I come back it’s not gonna be the same.. I will not have a home here anymore.. 😦 How long have you been here in Paris? are you staying for good? So funny, whenever I want to get out I go to Paris, live in Versailles lol!!! indeed. between the station you mean rive gauche( Versailles has 3) and the palace is too much touristic, but O’Pub Paris is ok, and you better off by rue satory or in the Notre Dame district nearer me.Au Chat Qui Prise, and Montbauron . Thanks, Deano!! I’m looking forward to reading about your whirlwind European jaunt. Were you able to find any Flea treasures? T.
Hi Theadora, my timing was never great on the flea market side of things and most things were closed or I just couldnt make it. A shame as I was looking forward to finding some unique treasures. Gorgeous place! Absolutely love your blog! Great post! The hamlet is really a gem; when I came upon it one day by surprise I was like “wha? are you kidding me?”. It was a fantastic surprise. My favorite detail about her pretend “rustic” lifestyle is how only the most beautiful and docile farm animals were chosen for it, with sheep being cleaned and groomed before she milked them, and chicken eggs being pre-washed before she arrived to gather them. Not unlike our modern concept of “camping” by renting a furnished cabin with internet and a microwave! I didn’t know the Petit Trianon was originally for Madame de Pompadour, which is an interesting tidbit. Thanks again for a great post! Thanks, Corey!! I loved your “modern concept of camping” comparison! Perhaps one day, they’ll open the other Hamlet buildings. Fingers and toes are crossed! Say, have you participated in any of the foot races in Paris? If you enjoy running, the Paris to Versailles race is fast, steep, and scenic. It’s usually held in September or October. I’ll check the calendar to see if it’s being held this year. Again, as always, thanks for your thoughtful words and gorgeous Paris posts!! 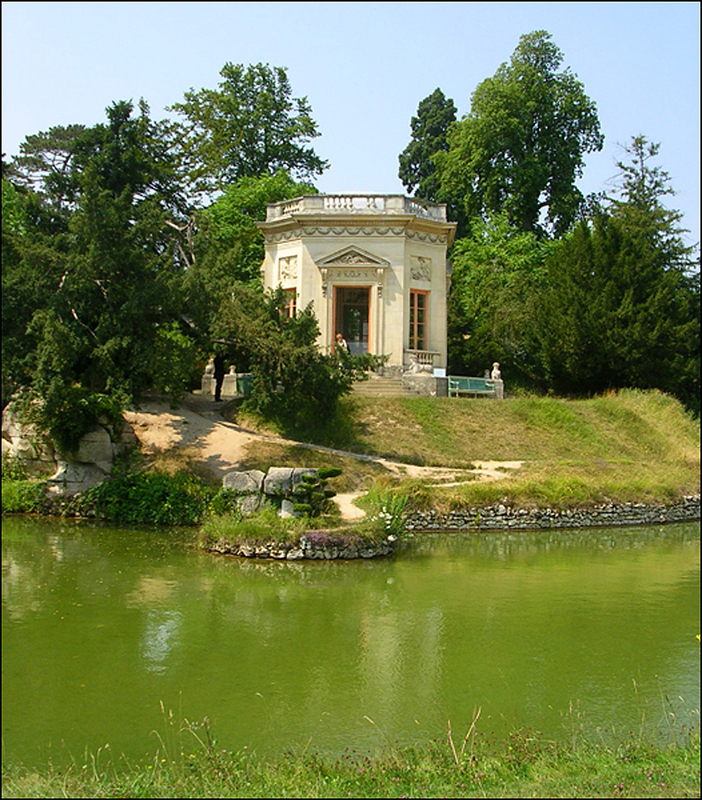 T.
And yes, Petit Trianon was built for Madame de Pompadour, but sadly, she died before they completed the project. Lucky for Madame Du Barry! Nopes I’ve never been to Paris but I’d so love to! This is a gorgeous post! Award coming your way: http://thewitcontinuum.wordpress.com/2012/06/18/monday-2/ You are always so inspiring! No way! I love cats! And, of course, I love Zelda! Way to go! Now that’s some shopping’! Amazing post! I wish I could experience just half of what you do and am so happy you share it all with us! 🙂 Amazing photos and I LOVE your shoes. Lovely photos and stroll! It’s hard to imagine a gift like that at 19. 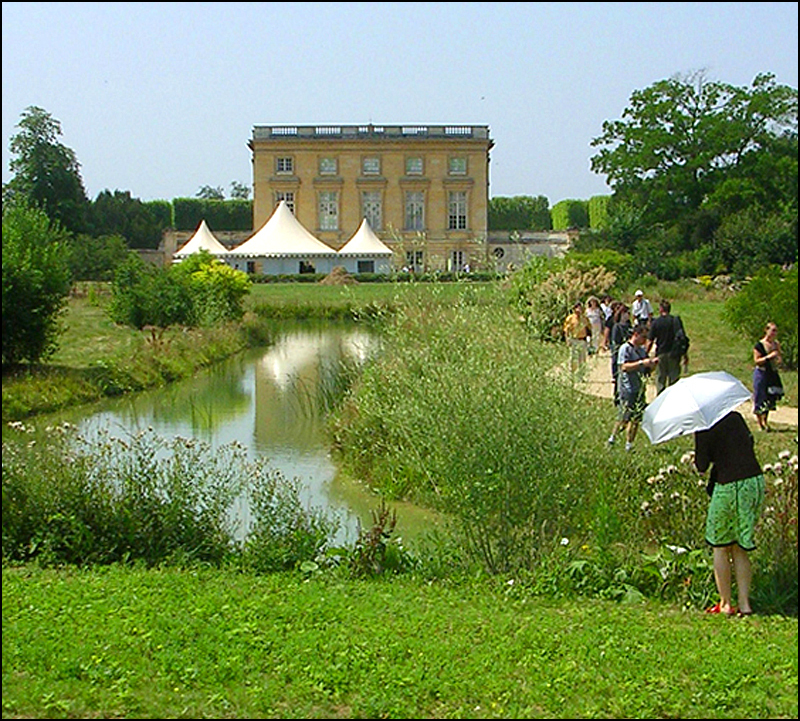 I’d love to visit Versailles someday, and after all I’ve heard about it, le petit Trianon also. Thanks for the lovely photos (and your very funny comparison of M.A. to Lady Gaga!). Gorgeous! So much fun. Thank you for showing us sights I would otherwise not be able to see. Your beautiful photographs transport me out of my stress filled office to a place of relaxation and meditation. Thank you! Wonderful post. Loved the daytripping shoes, and everything. 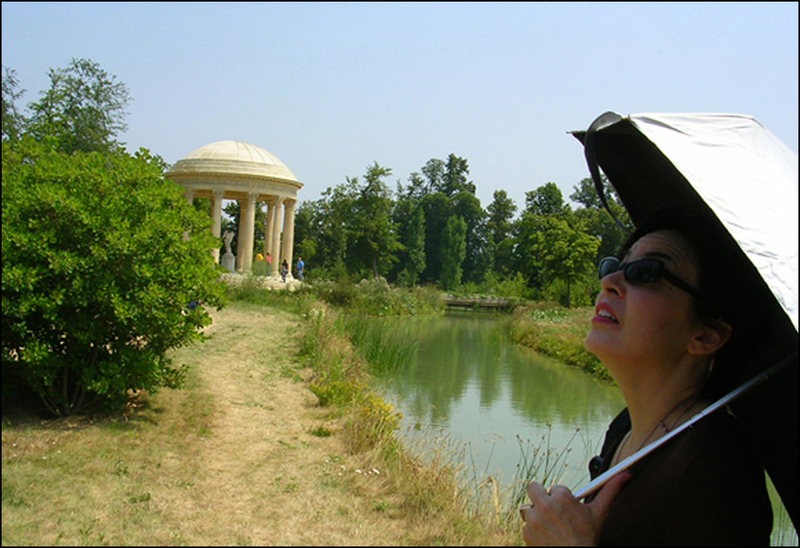 Marie Antoinette’s Petit Trianon is one of my all-time favorite places to visit – such an idyllic setting! Some of my favorite photographs have been taken there. What a magical mystery place! Cool! Thanks my friend!! I’ll be going through your site with my notebook soon! Thank you for all you do – I can’t wait to blog from France! Easy to see why Marie liked this place. Beautiful! I’m an old retired guy living in the middle of Iowa, which is probably not you target audience, but I so much enjoy reading your posts. I look forward to seeing more. Oh Theodora, what an elegant day! My visit there in 1999 was not so elegant. We rented bicycles at the palace and rode on down (half way I realized the tires were flat), and I got busted by the guard with walkie-talkie who was not impressed with my casual response to his warning of no bikes in the trianon…..it wasn’t casual, really, i was just trying to tell him yes, I would leave, I just needed to wait until my husband saw me so we wouldn’t get separated….and then he started with those walkie talkies and I high-tailed it out of there. I thought I was going to get thrown in the pond. This was really neat. My niece is visiting in France right now and was just at Versailles the other day; so seeing your post was quite appropriate! Wonderful post, Theadora! I’ve been to La Petite Trianon and adored it – absolutely charming. In an interesting coincidence, I just watched Coppola’s “Marie Antoinette” for the umpteenth time last night. A bon-bon of a film! What a fantastic place! We are visiting Paris in Oct–can’t wait to see it! Nice post – love the first photo, almost like that moment before the curtain rises…and the blog starts! Loved this post – just back from a great trip combining Versailles and Paris. The night fountains show in Versailles was FAB – a bargain at just €23! (Some hot shots on my blog if you are interested). And Paris…my heart skips a beat at the mention of its name….there will always be Paris….Keep inspiring. Merci! I love the fountain shows at Versailles! It’s the perfect Paris day trip. I’ve attended the weekend daytime spectacles.nighttime shows to my to-do-list. For the love Lully, it is a treat. Adding the So you have photographs? I’ll pay a visit and a grab a link! T.
Here you go: Versailles night fountains show. Enjoy! Merci! I’m off now to check out your work! Good. Golly. Your twilight and nighttime photographs of Versailles and the fountains are fantastical! Again, thank you for sharing the link! You captured some lovely moments. I loved the croucher. And your headline: Versailles: Bling, Bling, Bang, Bang. My dream to visit this very spot….someday. sigh. It’s a beautiful spot, Tania! Do add it to your list! ~T.